When and why did you first become interested in gymnastics? I started classes as soon as I could walk. My mom was a gymnast, so she put all of her girls in classes which eventually translated into team. Do you have any good/funny memories from when you first started taking gymnastics classes? All I know is that I would always run away and never want to do what the coach told me to do. When did you decide you wanted to compete? And, when did you want to compete at a high level? What about competition appeals to you? I started competing when I was 6 years old. I think I have always wanted to compete at a high level because I would watch my older sisters compete at high levels and I look up to them. I love competing because I love watching all my hard work pay off while having the most fun. What is your training regimen? Was that a big change when you made the switch to competitive gymnastics? We practice Monday-Friday from 1:15 to 5pm. It wasn’t too big of a change for me when I was younger because I just loved being in the gym so when I got to be here longer I was happy. What is your favorite skill? Full-in on floor. What music do you use for your floor routine? Some of it is from the movie Wolf of Wall Street and some is Angi Cipras old floor music. Who is your favorite gymnast or who is your “idol”? 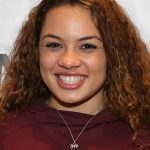 Laurie Hernandez. How have you grown as a gymnast during your career, both skill wise and mentally? Skill wise since my first year of level 10 has grown a lot. I have a lot of new upgrades since then on every event. Mentally, I have grown more than anything. My focus and confidence while in the gym and competing has gotten so much stronger. How has gymnastics helped you as a person? Gymnastics has taught me respect, confidence, teamwork, mental toughness, you name it gymnastics has taught me it. I wouldn’t be the person I am today without this sport. If you had to select one life-lesson that gymnastics has taught you, what would it be? Everything happens for a reason. What are your biggest accomplishments or best memories in your career? My biggest accomplishments/ best memories would be winning J.O nationals in 2017 and qualifying for the Nastia Cup five times. What grade are you in school? I am a junior. Do you want to compete in collegiate gymnastics? Yes, I am committed to the University of Alabama. If you plan to go to college, do you know what you want to study there? Special Ed teaching. What are your goals for the future, both as an athlete and after you are finished competing? As an athlete my goal is to win the Nastia Liukin Cup but more importantly stay healthy throughout my career. For the future, I would like to be a special education teacher for kids/babies and being in a sturdy place in my life. When you’re not in the gym, how do you enjoy spending your time? Do you have any hobbies or favorite activities? I like to sleep,relax and have fun with friends. Are any of your family members current or former athletes? Which sports? Yes. My mom and sister went WVU on full ride gymnastics scholarships. My dad played football at WVU and in the NFL and my brother plays football, basketball and baseball. Do you have any competition rituals? Lucky charms? Yes. I have to have my stuffed pandas with me at every meet and I have to visualize all my routines the night before. What’s on your IPod right now? What type of music do enjoy listening to? How about before a meet when you’re trying to get focused and pumped up? I usually like listening to early 2000s hip hop and R&B but before meets I don’t listen to music I like to visualize. If you had to pick 3 words to describe yourself as a gymnast, what are they? Powerful, fun, strong. A: I started gymnastics as soon as I could walk. My mom and sisters were both gymnasts. A: I wouldn’t go out on floor without my mom, or I would start crying. A: I started competing when I was 5. I just loved the sport and wanted to keep moving up the levels. A: It’s helped me learn respect, responsibility, and confidence. A: Qualifying for the Nastia Cup and scoring and a perfect 10 on vault. A: I’m a freshman at Pickerington High School Central. Q: When you’re not in the gym, how do you enjoy spending your time? Do you have any hobbies or favorite activities? Charities? A: I like spending time with my family. A: My mom and sister were both gymnasts. Q: When did you decide you wanted to compete? And, when did you want to compete on the elite level? What about competition appeals to you? Q: What’s on your iPod right now? What type of music do you enjoy listening to? How about before a meet when you’re trying to get focused and pumped up? Sydney is a sixth grader from Pickerington, Ohio. 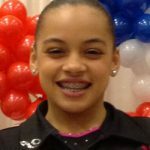 As a 12-year-old, she has been participating in gymnastics her entire life. Being an athlete comes naturally for Sydney. Her mother and father were both Division I athletes, competing in gymnastics and football at West Virginia University. Sydney started gymnastics as a toddler because her older sister was competing. 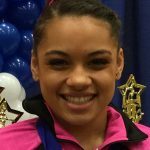 She has ambitions of becoming an international elite, having competed in the Hopes division at the 2012 Secret U.S. Classic, where she won the vault title, and to make it to Level 10 Junior Olympic Nationals. Sydney won the Level 9 Region V all-around and floor titles in 2012. 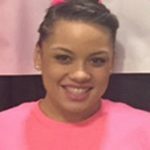 Sydney is currently a member of Buckeye Gymnastics Club, where she trains under coach Kittia Carpenter. Carpenter says Sydney is a “powerful, dynamic and confident performer.” Encouraging her teammates and being part of a team is the best thing about competing, Sydney said. 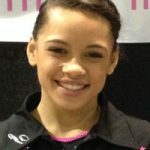 In fact, she idolizes 2012 Olympic all-around gold medalist and former Nastia Liukin Cup competitor Gabrielle Douglas because of her outward confidence and her success as a teammate. Sydney and her teammates train for about six hours a day. She loves to perform on vault because it comes naturally to her. Sydney has one brother and two sisters, each competing in their chosen sport. She enjoys horseback riding and taking care of her horse. Her favorite subject in school is history, and she enjoys reading, as well.